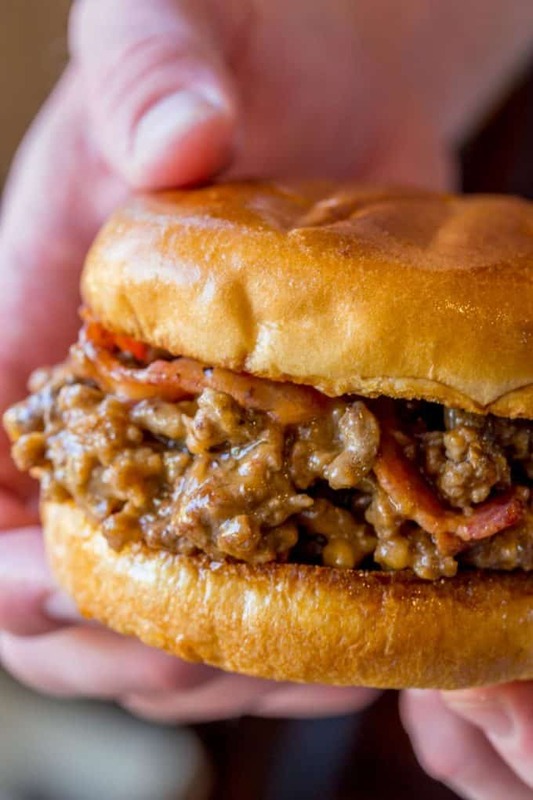 Bacon Cheeseburger Sloppy Joes had to happen. 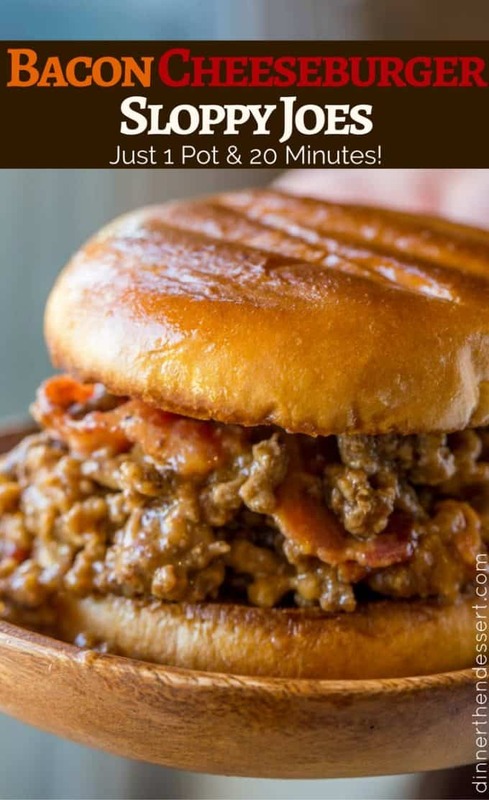 After these Philly Cheesesteak Sloppy Joes made immediate waves on this day last month (over 500k pins on Pinterest and over 12 MILLION views of the video on Facebook since then) I knew I wanted the one month celebration to be either another Philly Cheesesteak recipe or another sloppy joe recipe. 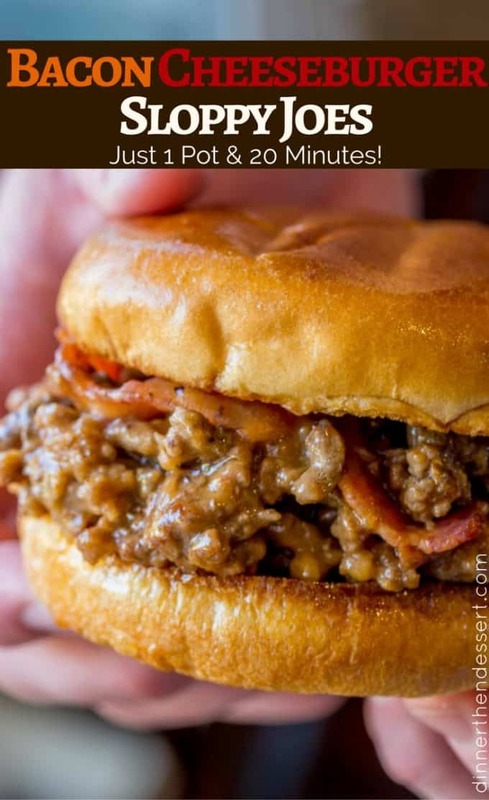 Then we made these Bacon Cheeseburger Sloppy Joes and I had that sweet sweet Joey Tribbiani moment and I knew what my one month celebration recipe was going to be. There really could be no competition. 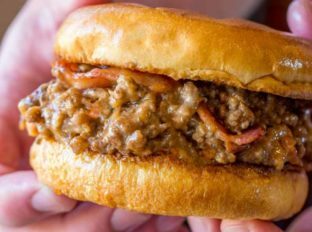 The sandwiches are crispy, cheesy and the ketchup and mustard mixture perfectly mimicks the flavors of your favorite bacon cheeseburger. 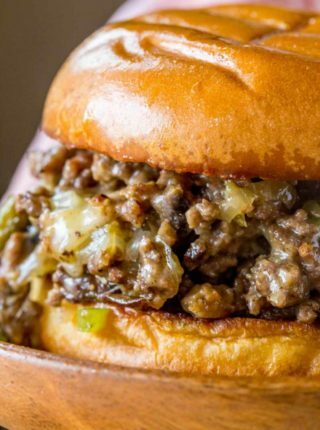 With the gravy and cheese mixture even the ground beef crumbles will be so delicious and sloppy you’ll forget all about that takeout bacon cheeseburger! Add the Ingredients (minus the cheese and buns) to the slow cooker and cook on low for 4 hours. Use half the amount of beef broth. If the sauce is not thick add in another 1 tablespoon cornstarch mixed with 1 tablespoon room temperature water. Cook for an additional 30 minutes on low. Add the cheese and bacon once you’re ready to serve. 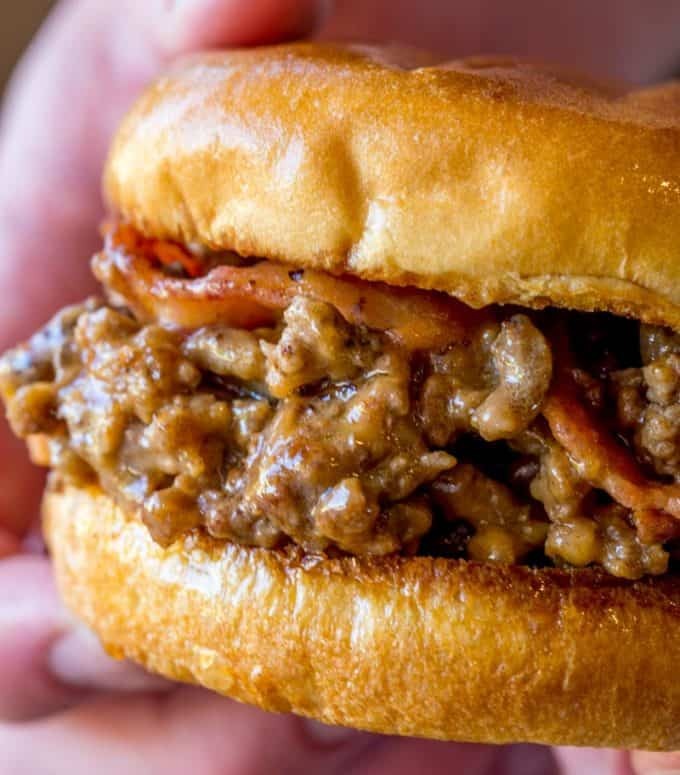 And if you’re looking for more sloppy joe’s in addition to this one and the Philly Cheese Steak Sloppy Joes, I’ve also published Pizza Sloppy Joes and Ultimate Sloppy Joes. Remove the beef, drain the fat and add the bacon to the pan. Cook the bacon until crisp, then remove to cool and crumble. Add the ketchup, mustard Worcestershire sauce, salt, black pepper, beef broth/cornstarch mixture into the pan. Add the bacon back into the pan and stir to combine. 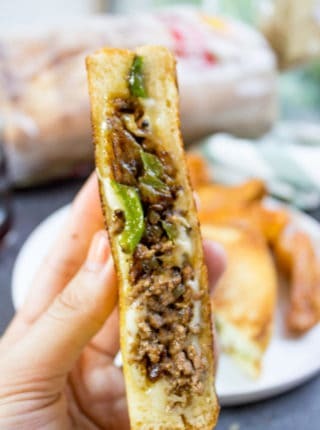 Turn off the heat, add in the cheddar cheese and fold into the meat with a spatula until just melted. It was good. Added a small can of mushrooms right before adding the cheese. Used regular hamburger buns because grocery store was out of brioche. So glad you enjoyed them, Birdie! 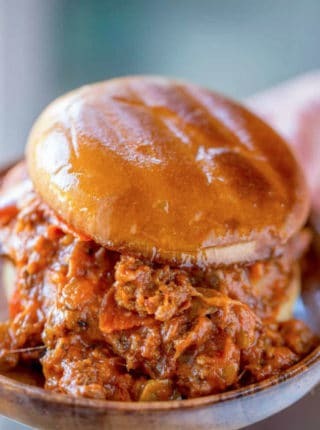 Good good sloppy Joe substitute. You’re welcome! It’s fun to change things up. My wife made this for us this evening. We liked it. But, I am diabetic and on a prescribed diet, so I need nutritional information. There is a “Nutritional Information” title at the end of the recipe, but no information is there. Where can I find that information? Sorry, I think it was a glitch. I just added it back in…fingers crossed it sticks this time. So glad you enjoyed it! I made this tonight. I, too, love the crust formed on meat in a cast iron skillet. My picky family LOVED it. I will definitely be making it again! Thanks for sharing this recipe! I love hearing that even the pickiest of eaters enjoyed it!! A true success in my book! Thanks for coming back to let me know. Thank You for such an amazing and Yummy Recipe. I will definitely make it again and look forward to more of your Recipes!!!! Wow, made this tonight for dinner. I loved it and it was a hit with my husband. I’ll be adding this recipe to my cookbook. It’s a keeper! Thanks for a really great recipe. Only thing missing is pickle, need pickle in a bacon cheeseburger!!! You can certainly add pickle if you like! 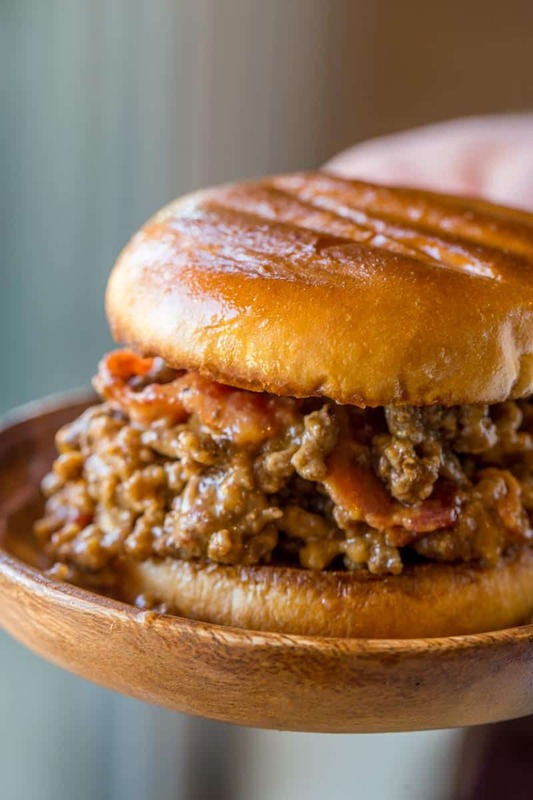 I’m not shy about adding pickle to my sloppy joes (see my Cuban Sloppy Joes)! Wondering if this does well if frozen? I do a lot of make ahead meals & would love to try this! I’m thinking the bacon would get chewy in the freezing process but maybe you could freeze the rest and add that in the day you make it. If you decide to try, I’d love to know what worked for you. Super easy and tasty! Added a couple teaspoons of bbq sauce because that’s what we usually put on burgers. Will definitely make it again! No one ever seems to include a calorie count, and I can’t for the lie of me figure out why! Any guess on the per-serving calorie count? Yay!! So glad you all enjoyed it! So good! My husband and I loved it! Super easy, quick, and delicious! This is delicious! I made it without the cheese because my roommate has lactose intolerance. It was so easy, making it again next week! Do you drain the bacon grease before adding everything back into the skillet? I didn’t but if you feel like there is a lot, you can drain some of it but you want to keep some to brown your onions. Enjoy! does it have to be made in a cast iron pan. i don’t have any of those. No, you can use any skillet. I just love the crust that a cast iron creates with the meat. This was a great recipe and everyone loved it. Fantastically easy to make and husband had seconds. He loved it!! Great for leftovers too!! Always a good sign when they go back for seconds!! Yes, though I would probably add in the cheese and the bacon the day of the party. Enjoy! 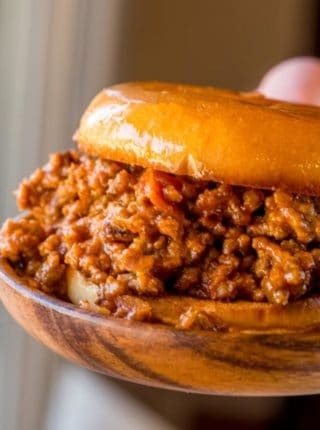 I don’t like sloppy joes, but I saw this and had to try it. It was so delicious. I love the crisp texture of the hamburger, it added an extra dimension to the dish that put it over the top. Thank you so much for the 5 star rating Kristy! So glad you enjoyed it! Just saw this and cannot wait to make it. Looks so delicious. Thanks. You’re welcome, Cathy! Hope you enjoy it!! How important is the ketchup to the recipe? I’m allergic to tomatoes so wondering how much flavor is added to the dish and if I could just leave it out or perhaps just add a little sugar. What are your thoughts? It’s pretty important as it gives it some of it’s flavor. I would suggest using a ketchup substitute instead. I know there are some recipes online that you can make that contain zero tomatoes. Excellent! Easy and quick.. it was an amazing video Saturday night meal!! My hubby has requested this three times this month. It’s so good. I’d definitely call that a win!! I will definitely be making this recipe. It looks so delicious. Wish I had it to eat right now. I just know it is going to be very yummy. This was great, it had a philly cheese steak kind of taste. great recipe. my family really enjoyed it. Thanks for taking the time to come back to let me know how much you all enjoyed it! Today my cheeseburger and sloppy joe had a baby. It was so delicious AND easy! Crowd pleaser!